Here are the beloved adventures of the mischievous hero Robin Hood and his brave and merry band of outlaws, who forged a chivalrous code to protect the oppressed and despoil the oppressors. Follow along as Robin makes his breathtaking escapes from his archenemy, the Sheriff of Nottingham, while classic characters like Friar Tuck, Will Scarlet, and Little John create one hilarious escapade after another. 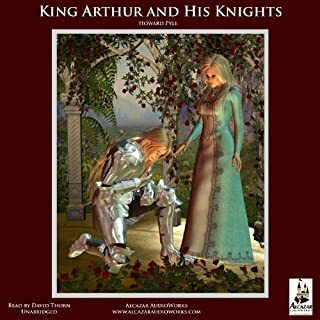 Pageantry, knights, and beautiful maidens of old abound in the episodes comprised by this favorite story. Russell Crowe will star in the November 6, 2009 movie Nottingham. 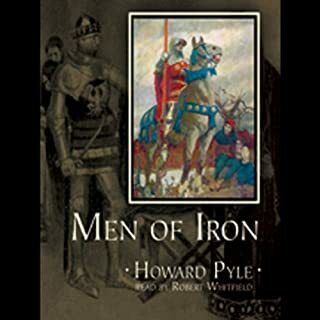 Howard Pyle was the writer who put together stray tales of the English outlaw and created the narrative of Robin Hood we know today. His original novel is still great fun -- it took my kids (ages 9 & 10) a little while to get used to the language, but then they absolutely loved it. They've been acting out scenes and cracking themselves up. The narrator of this edition, Christopher Cazenove, is spot-on perfect for the material, too. exciting story-telling, rollicking lust for life, savory conversations, compelling songs, apt aphorisms, beautiful descriptions of nature, irreverent chastising of corrupt authority figures, interesting figures of speech (comparing, for example, the swift passing of Robin's anger to a breath on a window pane or the slow brain of a cobbler to a ball of unbaked bread dough), great humor (ranging from comical slapstick to witty banter and funny irony), and thoughtful movement from the light-hearted merriment of youth to the joy and grief of nostalgic maturity. Christopher Cazenove reads with a clear voice and a charming manner and an effective range of accents and moods for the various characters, among them the good-hearted and stout Robin, the brawny and faithful Little John, the refined Will Scarlet, the querulous Sheriff of Nottingham, and the bestial bandit Guy of Gisbourne. Cazenove even remains in each character's voice as he sings the occasional catchy or lovely folk ballads. 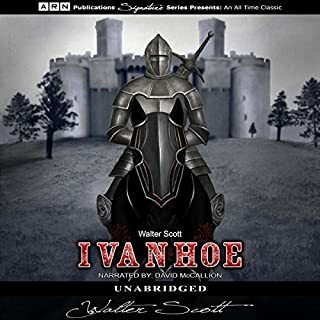 He infuses his reading with such meaning, humor, and life that listening to this audiobook was a pure pleasure that made me smile and laugh and finally moved me to tears. 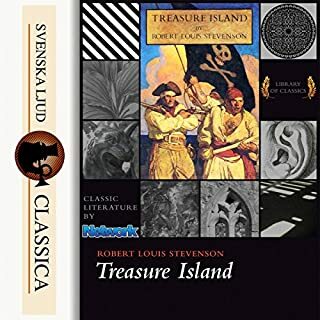 This great classic is a wonderful read for anyone who loves the adventure and vivid characters found in the novels of Dumas or the wit and whimsy discovered in those of Twain. Reading Pyle's Robin Hood is like taking the two together in one mighty draft of fine literature! This is considered a "kid's book." But much like with The Hobbit, it's written so much better than a lot of adult novels today. Sign of the times, I suppose. But as a kid's book, this puts aside the grim and gritty of today's fare and gives the reader something fun and truly wonderful. I've grown up reading this book, and to hear it via Audible is a treat. Each chapter is a self-contained event, often with the next chapter building making a callback to the previous ones as a reminder. This means that while it's essentially a group of short stories, there is a continuity for those who appreciate such things. Readers who are familiar with Robin Hood in his many multimedia incarnations will probably be quite surprised to learn both Robin's "origin story" and some of the other tidbits here and there. Just because it's fun, it doesn't mean it doesn't have a bit of dark thrown in for added weight. Pyle doesn't talk down to the reader, and as the title suggests, there's more comedy and farce than anything else. This book is a classic, and it holds up. Highly recommended. It's a great read for anyone of any age. 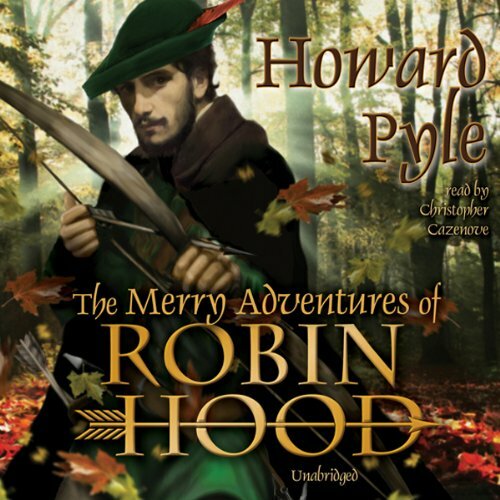 Would you consider the audio edition of The Merry Adventures of Robin Hood to be better than the print version? I love the playfulness and characterizations in this performance! If you enjoy the Robin Hood myths, this is a fun version. And this can serve to answer all of the other questions listed here, so forgive me as I repeat myself. What does Christopher Cazenove bring to the story that you wouldn’t experience if you just read the book? You who so plod amid serious things that you feel it shame to give yourself up even for a few short moments to mirth and joyousness in the land of Fancy; you who think that life hath nought to do with innocent laughter that can harm no one; these pages are not for you. Clap to the leaves and go no farther than this, for I tell you plainly that if you go farther you will be scandalized by seeing good, sober folks of real history so frisk and caper in gay colors and motley that you would not know them but for the names tagged to them. …Beside these are a whole host of knights, priests, nobles, burghers, yeomen, pages, ladies, lasses, landlords, beggars, peddlers, and what not, all living the merriest of merry lives, and all bound by nothing but a few odd strands of certain old ballads (snipped and clipped and tied together again in a score of knots) which draw these jocund fellows here and there, singing as they go…And here is a country bearing a well-known name, wherein no chill mists press upon our spirits, and no rain falls but what rolls off our backs like April showers off the backs of sleek drakes; where flowers bloom forever and birds are always singing; where every fellow hath a merry catch as he travels the roads, and ale and beer and wine (such as muddle no wits) flow like water in a brook. This country is not Fairyland. What is it? ‘Tis the land of Fancy, and is of that pleasant kind that, when you tire of it—whisk!—you clap the leaves of this book together and ‘tis gone, and you are ready for everyday life, with no harm done. And now I lift the curtain that hangs between here and No-man’s-land. Will you come with me, sweet Reader? I thank you. Give me your hand. I admit to being somewhat taken aback when a chorus of children announced this recording was part of “Audible Kids”. Even ersatz Medieval English is sometimes a tricky thing to follow, even for an adult versed in English Lit; no doubt children were more open to the truly wonderful—or willing to make an extra effort—back in 1883. Unfortunately, not all is perfect in the land of Fancy. 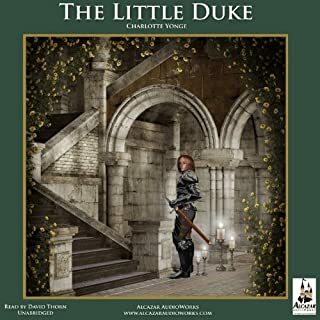 Christopher Cazenove’s singing—and there are many songs woven through the story—doesn’t come up to the level of magical sweetness promised in the text. But there I go again, plodding among serious things. The narration throughout is as much a treat as the story being narrated. Go ahead and enjoy. As Howard Pyle promises, everyday life will surely be there afterward, and no harm done. I learned of this book from John Senior's list of books at the end of the Death of Christian Culture. The older English of Pyle's composition is beautiful and was educational for my children. The stories themselves are delightful. Finally, I cannot praise the reader enough: just listen to a sample. He does wonderfully with different character types. A great listen - with humor, adventure and a life lesson here & there! The old English storytelling can be a bit difficult to wade through sometimes but worth the effort. The narration is excellent, with well defined, engaging characters. The singing wasn't our favorite we sped through some of the songs. The characters were represented well. I loved it except for the end. 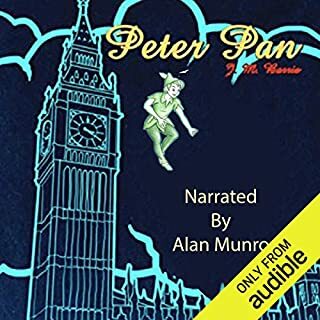 Great narrator and great adventure! A must read if you are a Robin Hood fan.